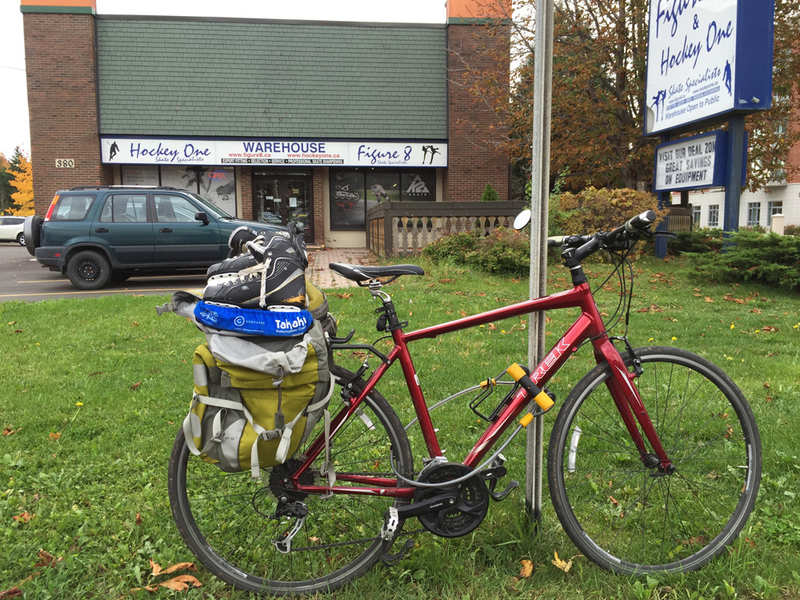 One of the finest places in the city to get your skates sharpened is at Figure 8, or Hockey One, on Industrial Avenue. They do a great job and keep track of how you like them done. Hockey season has started up for hundreds of kids around town and my sons skates needed sharpening. Blue line on the map is the bike route I took to get there from Centretown. Purple lines an alterations I took on my way back. 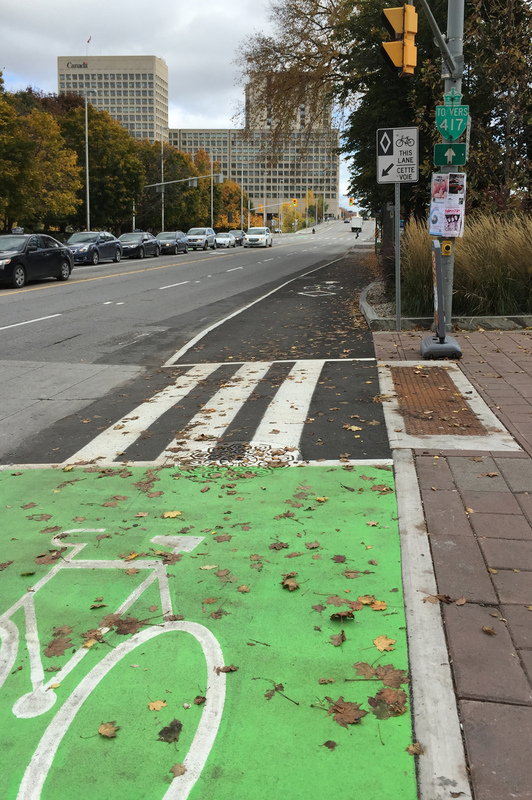 I rode along the Laurier Bike Lane which extends east of Elgin in front of the Provincial court house and City Hall. 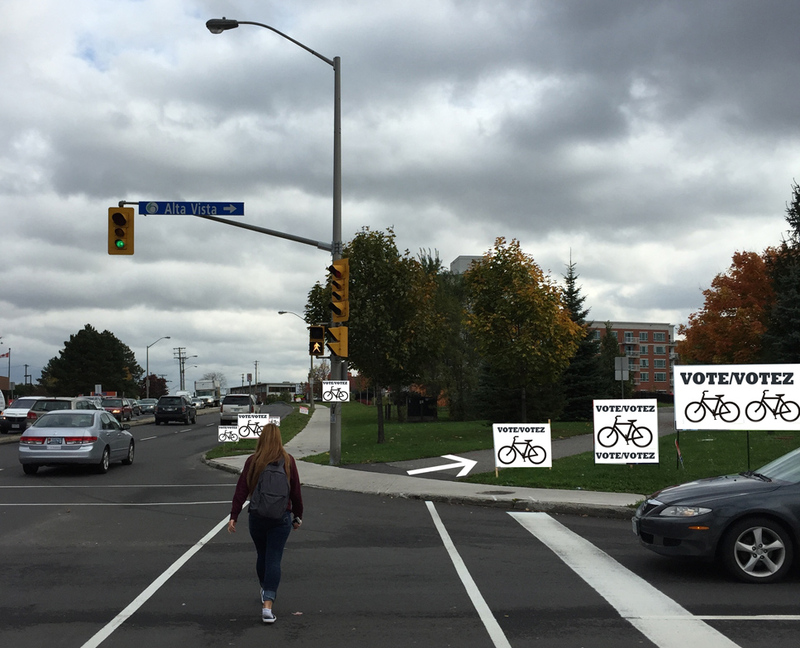 There’s a short bike lane just beyond City Hall to the right along the exit from Laurier to the Queen Elizabeth Driveway, as shown in the photo below, however there’s a sign at the opposite end suggesting the lane is for cyclists riding towards oncoming traffic. All a bit confusing, so if you do take this bike lane watch out for cyclists heading your way along with cars exiting off Laurier. A safer bet would be to cut through the plaza in front of City Hall (See green line on above map that I followed on my winter ride, crossing the Driveway at Somerset). 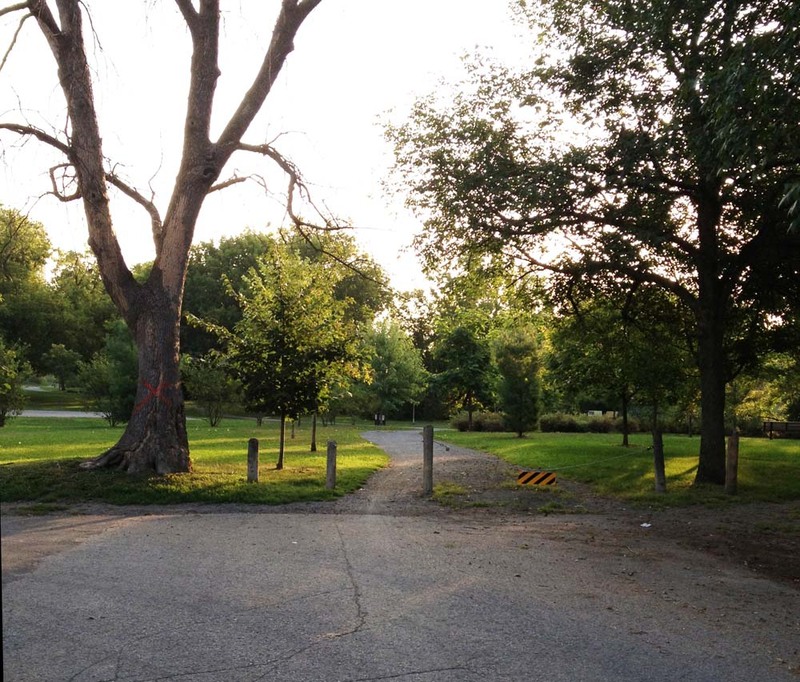 UPDATE – Summer 2018: There is presently a bi-directional multi-use path on the right side of this exit (not shown on the photo) making this exit much safer. I rode along the canal, crossed over the pedestrian/bike bridge at the end of Somerset, and continued along the canal until I turned off at the exit up to Pretoria Bridge. Graham ends at Main Street, and continues as Lees Avenue across the intersection. 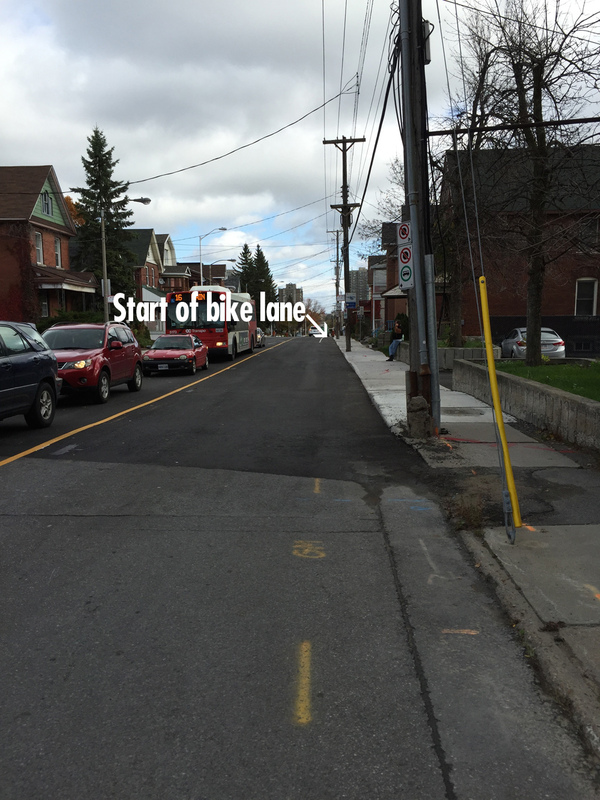 There is a bike lane along Lees heading east, but it doesn’t start for a hundred yards or so east of Main. 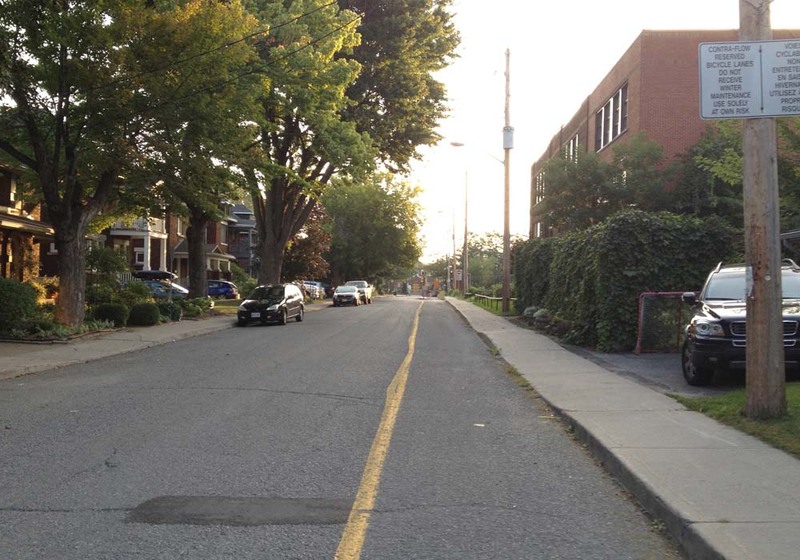 Depending on the amount of traffic, it may be safest to walk your bike along the sidewalk to where the bike lane starts. UPDATE – Summer 2018: The east bound bike lane now starts at Main St. The Lees bike lane abruptly ends at Chestnut Street. Drivers always speed along Lees Avenue. Without a bike lane it’s extremely dangerous. The ‘Share the Road’ sign partially obstructed by trees does nothing to alleviate this danger. I turned right onto Chestnut. 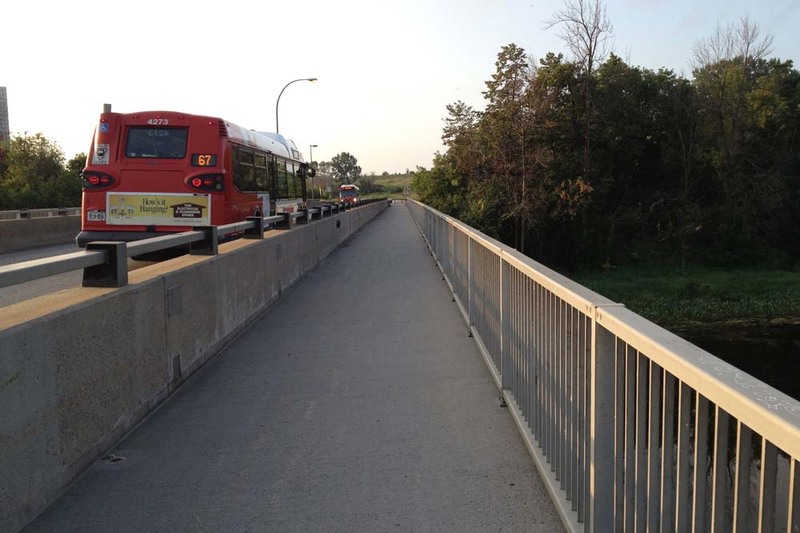 UPDATE – Summer 2018: The east bound bike lane now extends to the bridge over the Queensway. UPDATE January 8: Bike lane wasn’t cleared so I took the first opportunity to get off Lees and turned on to Rosemere Avenue. This took me to Springhurst Ave where I turned left and followed it to the path that brought me to the Rideau River Nature Trail. 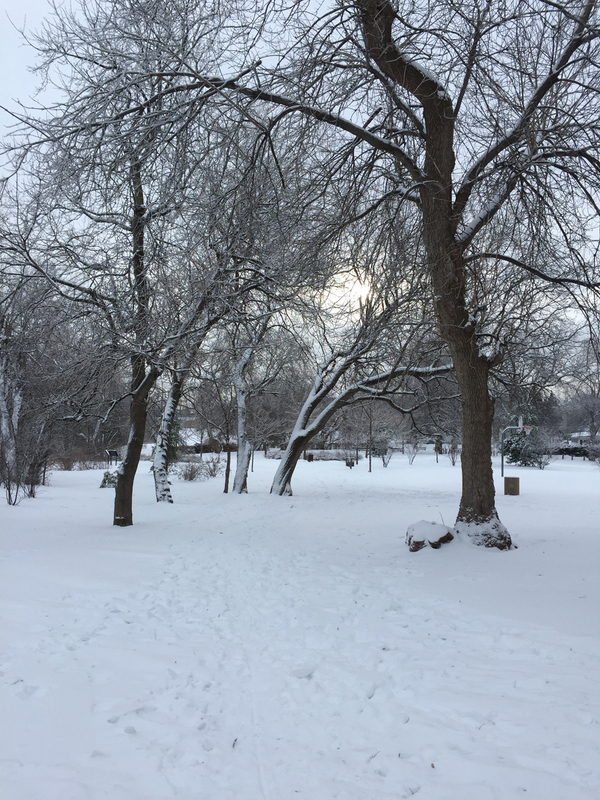 UPDATE – January 8: The Rideau River Nature Trail is not cleared in the winter, but it is packed down by pedestrians. I managed to ride along the path for half the distance and pushed my bike the rest of the way. A day or more without a snowfall and it most likely would be entirely bikeable. 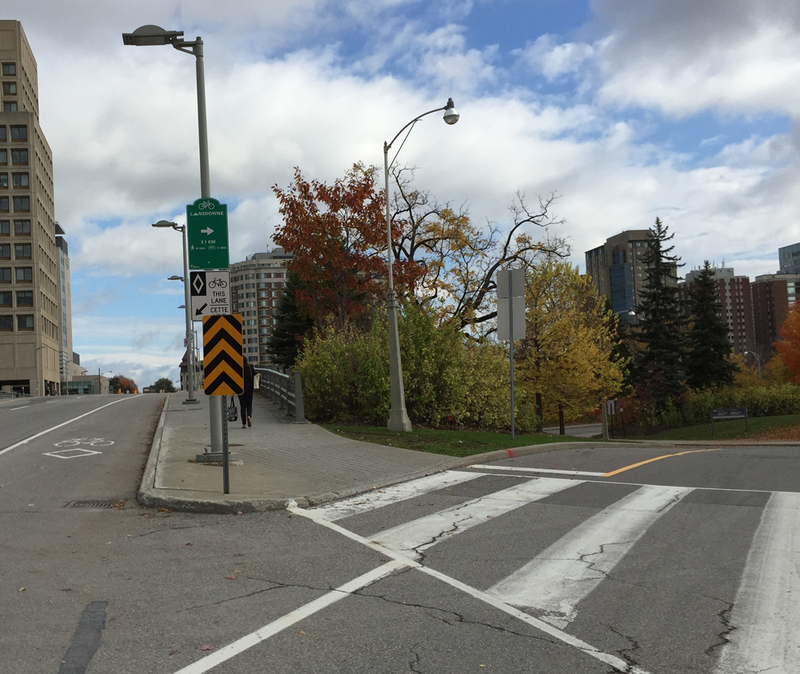 I continued past the OC Transpo hub to the intersection at Riverside Drive. I won’t deny this is a spooky major intersection, however don’t let it intimidate you. 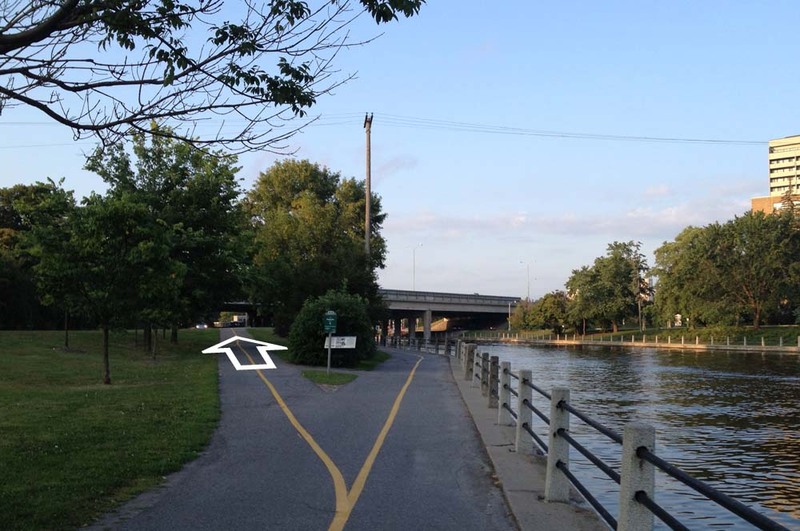 There are usually many other pedestrians and cyclists crossing at this spot and the path does continue on the other side of Riverside Drive along Industrial Avenue. Hockey One / Figure 8 is a bit further down Industrial Avenue, however the bike path veers away diagonally at Alta Vista Drive. True to it’s name, Industrial avenue has industrial quantities of cars and trucks desperately jockeying amongst themselves for lane position, so I followed the path off to the righ at the south east corner of Alta Vista and Industrial, and circled back behind Hockey one via neighbourhood Way. This adds just a few seconds to the ride and is definitely worth the safety factor. UPDATE: Fall 2015 – They have installed a bike rack just to the right of the front door under the overhang and told me they would leave it there throughout the year. A fine and encouraging initiative. On the way back, rather than get back on to Lees, which hasn’t any bike lane heading west, I rode up Evelyn Avenue where I crossed Main. 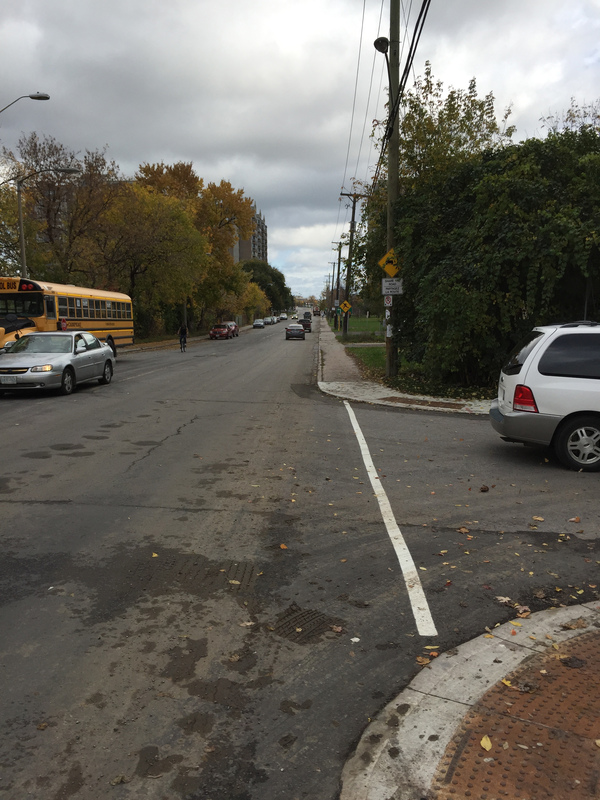 I then cut through the school parking lot to Graham Avenue.